I am proud of my guarantee to win every driver’s license restoration or clearance case I take. Even the quickest scan of the more than 400 driver’s license restoration articles I’ve written for this blog reveals that, beyond the occasional installment touting my guarantee, they are all about analysis and useful information. Within my archives, I take the time to explore every facet and step of the license appeal process in painstaking detail. I can safely say that I have put together more substantive material about Michigan driver’s license restoration and clearance issues than you can find anywhere else combined, and probably ten times over, at that. Yet as great as all that may be, the truth is that none of it matters if you don’t win your license back. And I truly believe that as a Michigan driver’s license restoration lawyer, my job is to not only do just that, but also guarantee that anyone who hires me will only pay me once to get back on the road. Why should anyone hand over their hard-earned money to some lawyer merely for a “shot,” or to take a chance at winning? You wouldn’t go to the appliance store and pay for a refrigerator that “might” work, would you? If you have a basement leak, you don’t look for a contractor to “try” and fix it; you hire someone to get the job done right and guarantee the work. The importance of a guarantee to the client is really priceless, but I’d be less than honest if I didn’t admit that I’ve done rather well by it, too, although not without some headaches. The biggest problem it creates is the mistaken notion in some peoples’ minds that all they have to do is pay my fee and I’ll guarantee to win their case. I ONLY, and let me emphasize again – ONLY – take cases for people who are sober. In other words, I won’t take a case for someone who is still drinking, or who even thinks they can still drink. “Sober,” in that sense, means you’ve quit drinking for good. I’ve written numerous of articles about sobriety, and I encourage the reader to look through some (or all) of them. The kind of people who wind up becoming my clients are generally information seekers; often “readers,” and, to the extent that they are my clients, always sober. The problem for me is that while not everyone is into such details, everyone, without exception, who has lost his her license wants it back, and loads of people see my website and/or this blog and, without reading enough, simply think, “he’s the guy.” Then, they see my guarantee, and they’re all but running to my door, thinking the faster they can pay me, the faster I can get their license back for them. It doesn’t work that way. The whole point of the license restoration process is to NOT give a license back to anyone who drinks at all, and even THINKS that he or she can ever drink again. The Michigan Secretary of State knows that the people who are the least likely to ever drink and drive (again) are those who simply do not drink. Through it’s Administrative Hearing Section (AHS), the state had drawn a very bright line: for those who have lost their license due to multiple DUI convictions, the only way to get it back is to prove that you have quit drinking for good. Sobriety, then, is a first (and non-negotiable) requirement for a successful license appeal. For my part, I’m certainly not going to take any case – and be stuck guaranteeing the results – for someone who has not genuinely embraced sobriety. To the extent anyone is unclear what is meant by “sobriety,” it’s probably because he or she isn’t quite there yet. In other words, people who are sober fully understand what it means. When you’ve made the dramatic and sweeping life changes required to go from drinker to non-drinker, there is no doubt what sobriety is all about. Getting sober, means, but is not limited to, ditching the drinking friends, staying away from the places where you used to drink (an old AA saying advises to “avoid wet faces and wet places”), finding new things to do, beginning to repair and/or reestablish relationships with the people who really matter, working to regaining their trust and respect, and generally overhauling everything else about yourself. Getting sober, then is about changing just about everything in your life, your lifestyle, and your outlook on life. If you’ve done all that, then you certainly don’t lack any clarity about what it means. From my end of things, sobriety is the main, and really the only thing I need in terms of raw materials to win a license restoration or clearance appeal for someone. Of course, a person must also be legally eligible, but with those things at my disposal, I can win just about anyone’s case. The internet is full of lawyers with a few paragraphs (or even a few pages) about license restorations, but finding a guarantee in any of that is pretty rare. I make it easy because I take the time to write these articles (I publish 2 blog articles every week), break everything down, make clear who can and cannot win, and then guarantee the results in every case I take. Whatever else, you won’t find all the resources I provide, along with a guaranteed win in every case, anywhere else. As a consumer, I simply cannot imagine even considering hiring someone for a license appeal who would not guarantee the results, no matter what the fee. As an attorney, however, I do understand why most lawyers don’t provide one. It takes years of doing these cases, day-in and day-out, to really learn all the nuances necessary to win every time. I’m not too proud to admit that much of how to do license appeals right is learned through trial and error. There is just no way some lawyer doing 2 or 3 of these cases every month (and most lawyers who “do” them will probably only do 2 or 3 a year) can ever accumulate enough experience to be able to guarantee his or her work. The week before this article was written, for example, I held 6 license appeal hearings along with doing 3 new license restoration intakes. Next week, I will handle at least 7 restoration cases. When someone contacts me with a complicated case or what otherwise seems like a unique situation, chances are, I’ve seen it before, and will be able to figure out how to properly handle it within moments. It is the mark of a good professional, however, to realize that you’re not omniscient, and to otherwise know when you need help. I am aware, for instance, that plenty of other lawyers read this blog and use the information here to navigate the license appeal process, and I’m happy to oblige. It’s a whole different level, though, when you have essentially become the main resource of that information. When you combine all that experience and knowledge with a guarantee, it means that my clients can leave my office with the satisfaction of knowing they’re going to get back on the road. They never have to ask things like, “what are my chances?” or “how does it look?” This isn’t experimental surgery, and I don’t “try” to win the cases I take – I simply win them. All of them. When I take someone’s money, it’s with the full understanding that I’ll win their license back. Period. Are there any exceptions to my guarantee? Sure, but nothing any honest person ever has to worry about. If, for example, someone lies to me and my evaluator about drinking (not likely it would get by either, much less both of us) and is later exposed, at the hearing, as still drinking, or having faked their sobriety date, all bets are off. In all the time I have provided my guarantee, however, I have NEVER refused to honor it. Equally as important is that I seldom lose, so I’m rarely required to so any warranty work in the first place. Honestly, if I didn’t have enough confidence in my representation to know that I’m going to win almost every single case I take, the thought of having to re-do things more than once in a great while would be a total buzz-kill anyway. 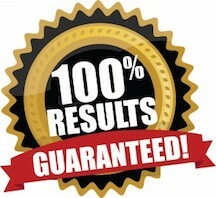 I provide a guarantee precisely because I know that I’m going to win. To be clear, as far as “exceptions” go, I have never yet declined to honor my guarantee. Thankfully, however, out of the more than 200 license cases I handle each year, only about 1 or 2 involve warranty work, anyway, so it’s not like I have had many opportunities. If you have lost your license for multiple DUI’s and you have honestly quit drinking, I can help. If I take your license restoration or clearance appeal case, I guarantee to win it. If you are looking to hire a lawyer, be a good consumer, take your time, and read around. When you’re ready, contact my office. We’re in Monday through Friday, from 8:30 a.m. until 5:00 p.m. (EST). All of my consultations are confidential, free, and done over the phone right when you call. You can reach us at 586-465-1980. We’re here to help.